Here we have a beautiful work of craftsmanship with a bespoke salad/fruit bowl. It is an ideal family size and would make an added addition to any table. 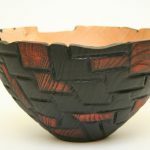 This unique bowl would make the ideal unique gift for any couple or for that special person. It is made from local Wexford timber and finished in food safe oil.